Who Is Cesar Sayoc? 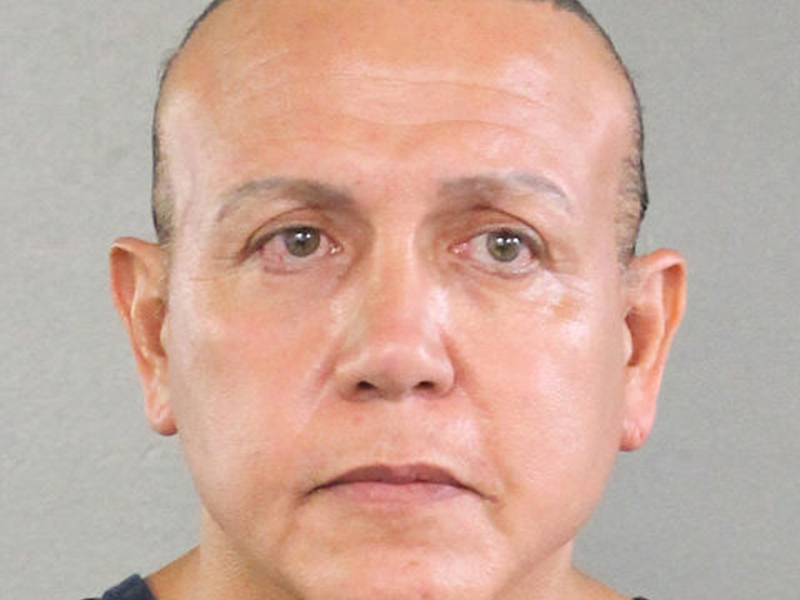 Bomb Suspect Has Criminal History, Attacked Democrats Online The Florida man charged on Friday ran afoul of the law for decades and was arrested for a slew of crimes, including larceny, drug possession and making a bomb threat. An undated police mugshot of Cesar Sayoc, who was charged Friday with sending explosive devices to critics of President Trump. Cesar Altieri Sayoc, the Florida man arrested and charged on Friday in connection with the wave of improvised explosive devices mailed this week to prominent Democrats and critics of President Trump, has a long criminal history, including a charge of making a bomb threat. The felony bomb threat charges arose from a dispute Sayoc had with a power company when he ran a laundromat business in 2002, Ron Lowy, Sayoc's former attorney, told NPR's Martin Kaste. According to Lowy, "Sayoc threatened to throw a destructive device, which occurred when he had a laundromat and they turned off the electricity and he called FP&L, Florida Power and Light, to turn it back on and they gave him a difficult time and he uttered, 'I bet if I threatened to throw a bomb, you would put it on real quickly.' "
Apparently, utility company officials called the police following the exchange and "shortly thereafter and arrested him for saying that," Lowy recalled. Court documents show Sayoc pleaded guilty to the charges. "I viewed it, as did the prosecutor, the judge and everyone involved, as a stupid, emotional, immature thing to say but there was no reason ... to believe that he would carry out such a deed," said Lowy, who currently represents Sayoc's mother and sisters. Lowy, who called most of Sayoc's cases "very run of the mill," described the man as someone whose "intellect is limited." "I believe he has issues comprehending concepts," he added. "He is like a little boy in a man's body." Sayoc was first arrested for larceny in 1991, according to court records, and that was the start of a string of run-ins with the law on charges that included grand theft, battery, fraud, and the sale of synthetic anabolic-androgenic steroids. Lowy added: "There was a drug possession case; there was a petty larceny case, which was shoplifting; and there was a possession of altered identification, which is when he altered his own drivers license to change the year of his birth to look younger because he was single and and he wanted to represent to women that he was younger than he was." Lowy told NPR he has not seen him in at least seven or eight years. But Lowy said the 56-year-old is homeless and has been living in a van for years. The van Lowy remembers was covered in Native American imagery even though Sayoc has no Native American ancestry. His mother is Italian and his father is Filipino. It is unclear if it's the same van cited in a criminal complaint filed by federal prosecutors in the Southern District of New York on Friday. The documents note Sayoc was arrested "in Florida in the vicinity of his white van" which had the windows "covered with images including images critical of CNN." As NPR reported, "FBI and other investigators surrounded a white van believed to be connected to the case in a parking lot in Plantation; their inspection was shown live on cable TV and the van was loaded onto a flatbed truck." 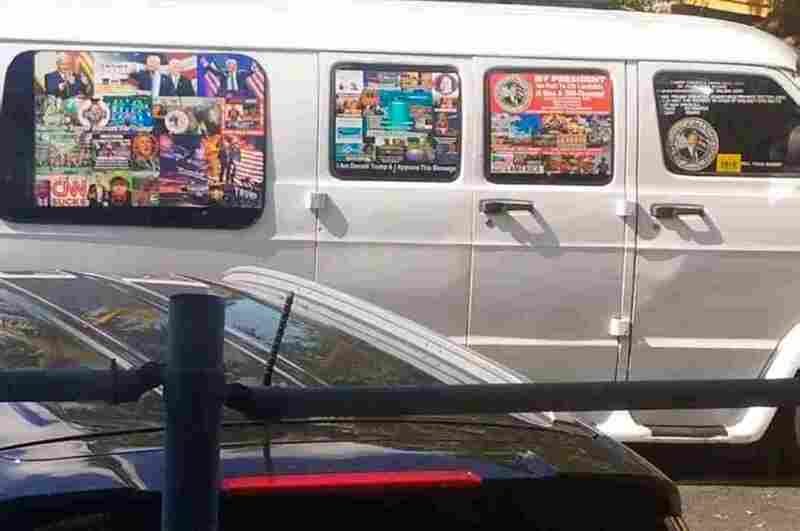 This Nov. 1, 2017, photo shows a van with windows covered with an assortment of stickers in Well, Fla. Federal authorities took Cesar Sayoc into custody on Friday and confiscated his van, which appears to be the same one, at an auto parts store in Plantation, Fla.
On Friday Sayoc was charged with five federal crimes. Court documents indicate he is charged with transporting explosives across state lines, illegally mailing explosives, threatening former presidents and others, threatening interstate communications and assaulting federal officials. He faces a potential total of 48 years in prison. However, during a press conference U.S. Attorney General Jeff Sessions remarked, "The charges may change or expand as the investigation proceeds." 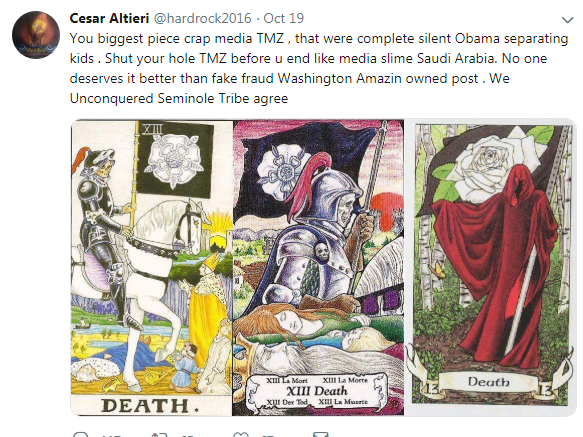 A tweet dated Oct. 19 from the account law enforcement officials say belongs to Cesar Sayoc. The account has been shut down. In recent years, Sayoc was an ardent Trump supporter and prone to threatening Democrats on what officials say are his Twitter and Facebook accounts. Some of his tweets lashed out at a number of those targeted in the mailed explosive device attacks. The account has been shut down. 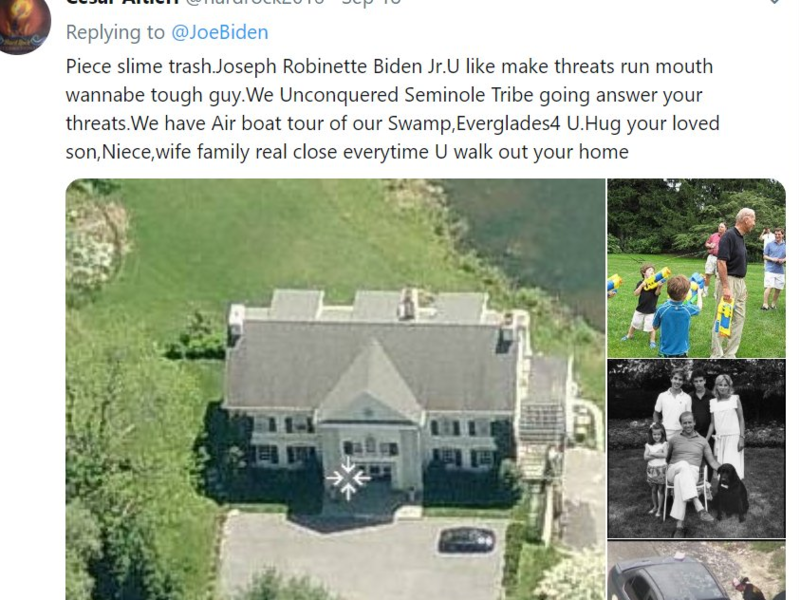 A tweet from the account law enforcement officials say belongs to Cesar Sayoc, apparently threatening former Vice President Joe Biden. Tweeting from @hardrock2016, Sayoc purportedly posted a menacing message directed at former Vice President Joe Biden that included photos of his home and family, and a screenshot of a news segment about a body found in the Everglades. "U hug your loved son,Niece,wife family real close everytime U walk out your home," the tweet said. A tweet dated Oct. 24 in which Sayoc apparently attacks Democratic politician Andrew Gillum, linking him to billionaire George Soros. 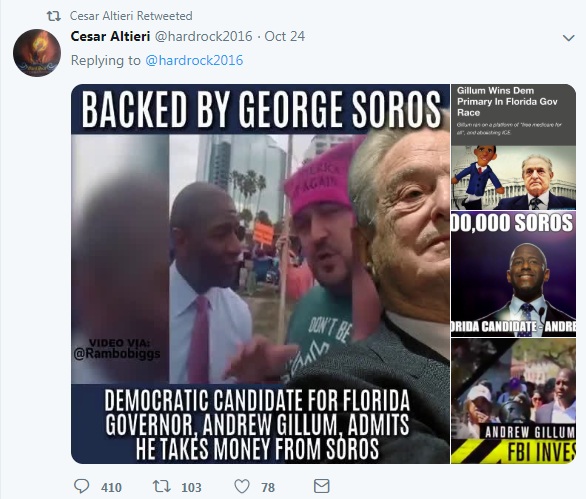 The most recent tweet posted on Oct. 24 features a collage of images against Democratic Florida gubernatorial candidate Andrew Gillum, featuring George Soros, the billionaire philanthropist at the center of myriad far-right conspiracy theories. Soros was the first of the multiple people this week to receive a suspicious package containing an explosive device. The manila envelope arrived at Soros' New York home on Monday. On June 7, Sayoc appears to have posted a video of himself attending a Trump rally. Only the top of Sayoc's face and a Make America Great Again hat are visible in the frame, but he can be heard chanting "Trump, Trump,Trump." He wished Trump, the "greatest President Ever," a happy birthday. Sayoc consistently posted or re-tweeted messages attacking immigrants, antifa, Parkland high school shooting survivor David Hogg, and former NFL quarterback Colin Kaepernick.